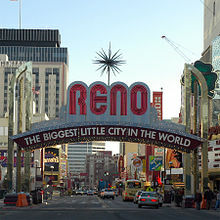 Every time we go to Reno, I feel a sense of excitement and adventure, because every time we go, we have a great time -- but every time I tell someone we're going to Reno, I feel a vague sense of defensiveness/sheepishness/apology/shame. Most of the kids' friends at school take their winter vacations in much ritzier places. They stay in chalets in North Tahoe, condos at Squaw Valley, hotels in South Tahoe, or fly to Aspen or Whistler. It's sort of like admitting you shop at Kmart or Walmart instead of Macy's, or eating at McDonald's instead of some chic organic/gourmet/celebrity chef cafe. After all, when people think of Reno, they think of wrinkled old ladies with one hand clutching a cigarette and the other hand clutching a slot machine lever. They think of tacky casinos and cheap buffets and seedy motels. They think of Vegas' neglected little brother. And it's true, Reno does have an air of disrepair and shabbiness about it, of tackiness and tired glitz, especially near the downtown casino area. Last night I dreamed that I was watching what might be the greatest game of football ever. All the best players in the world were there, including Cristiano Ronaldo, Lionel Messi, some blond guy and lots of others I can't remember any more -- you know how quickly dream memories fade -- but I know they were great. There were no team colors or kits, just regular workout gear, and there were no ugly fouls, no cheating or diving. The guys were playing just for the sheer joy of the game. The game was held in some kind of indoor arena, and the spectator area was like a parent's waiting area in a dance studio, separated from the pitch by a glass wall (hey, it's a dream, go with the flow). Anyone could just wander in and watch. The only catch? No photos allowed. Recently I bought a bunch of bento lunch box supplies: silicone baking cups, plastic picks, and plastic sauce cups. 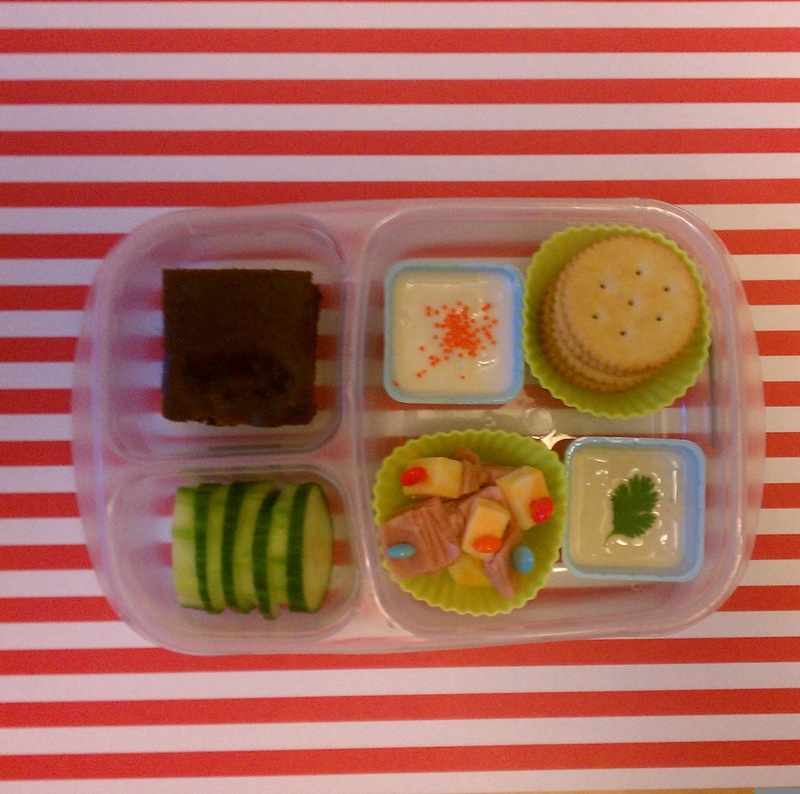 They certainly improve the presentation of the food and make it a whole lot more fun to eat! Even my kids aren't immune to the cuteness factor. Of course, garnish can be more than just for appearances: the blue sauce cups in the photo above are garnished with a cilantro leaf and orange sprinkles. Sure, it looks nice, but I also did it because I didn't want the kids dipping their cucumbers into vanilla yogurt or pouring ranch dressing onto their chocolate brownie! Thanksgiving is full of traditions: dressing in your holiday best, gathering with family and friends, feasting on turkey and cranberries, going round the table and telling everyone what they're thankful for. I didn't grow up celebrating Thanksgiving, but over the years that I've lived in the US I've come to enjoy the holiday and appreciate everything it stands for. How have I lived in the Bay Area for almost 20 years and never been to San Francisco's Ferry Building Marketplace before now? Okay, it was just a former ferry terminal that had fallen into disuse once the Bay Bridge and Golden Gate Bridge were completed in 1936 and 1937, and with the construction of the Embarcadero Freeway, it barely even saw daylight -- so I had no reason to know it existed. But after the collapse of the freeway in the 1998 Loma Prieto Earthquake, the whole Embarcadero area began to transform, and the Ferry Building underwent a massive renovation -- so after 2003, I no longer have an excuse. I had heard about the Ferry Building Marketplace, of course, but just never got around to going there. Even The Pea got to visit the place before I did! What's for lunch this week? Lunch break! It's Thanksgiving week, and the kids have Wednesday, Thursday and Friday off. That means I only have to make 2 lunches this week! Advanced Happy Thanksgiving to everyone, and I hope you enjoy the (lunch-making) break! This past weekend the boys went on their first-ever overnight soccer tournament, the NorCal State Cup for U9 boys in Davis, CA. Davis is less than 2 hours' drive from home, but their team had four games spread out over 2 days, and 2 of those games started at 8AM (7:15AM if you count their warm-up time) so everyone agreed it would be best to stay at a motel on Friday and Saturday night. I love watching their games, but with the holidays approaching and The Pea's Nutcracker rehearsals going and with our trip to the Manila looming on the horizon, taking a whole weekend off for soccer seemed excessive. Then we all came down with colds and flu the week before, so everyone was stressed out trying to recover. 3Po and Jammy shook off the virus by Thursday and I scraped through on Friday, but Alfie had to miss the whole thing, which was a huge blow since he's their biggest fan. The team hasn't been playing too well either, so I was not optimistic as I drove off, leaving a miserable Alfie and an ecstatic Pea (ecstatic because didn't have to go) at home. Didn't I just brag about my improving photo quality last week? I take it all back. This week's photos look worse than ever! I think it's because the mornings are getting darker and darker, and I just can't get a decent amount of light for my phone camera to focus with. What I need, of course, is a newer, more expensive phone with a better camera :) Don't let the grainy images fool you, though; the food featured this week is delish. I'm especially proud of the pumpkin pretzels in the photo above. It took me a few tries to get them looking all cute and pumpkin-like, but the result is worth it. 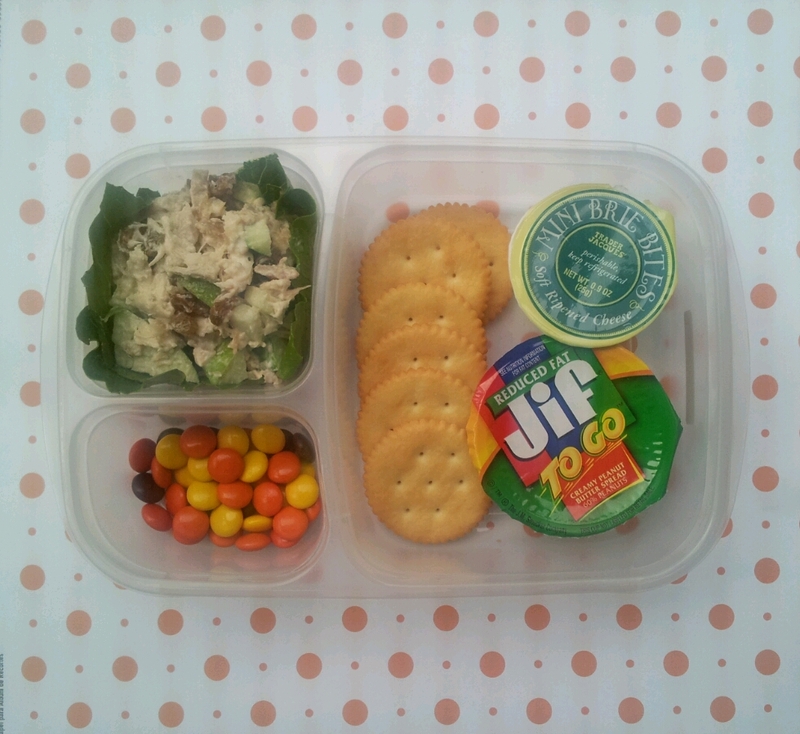 I may not spend time getting a good photograph, but that's because I'd rather spend the time making a yummy lunch! When you're blogging about food, a good photo is essential. You can rhapsodize over a savory chicken salad, buttery crackers and creamy brie wedge, but if it's accompanied by a photo that's blurred and washed out, no one is going to want to eat it. Over the past weeks I've tried to improve the appearance of my lunch photos, and although they're far from being Pinterest-worthy, I think they're looking as good as my time (milliseconds out of my crazy morning), talent (minuscule) and equipment (phone camera) will let them be. 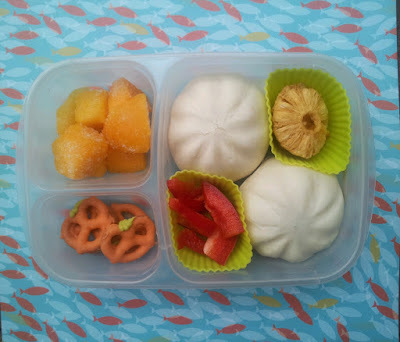 I try to shoot in natural light, and I've caught on to the trick of laying the bento boxes on a sheet of scrapbook paper so it looks more lively and colorful. Hopefully now they look like something you'd want to send to your kids to eat, or even eat yourself!